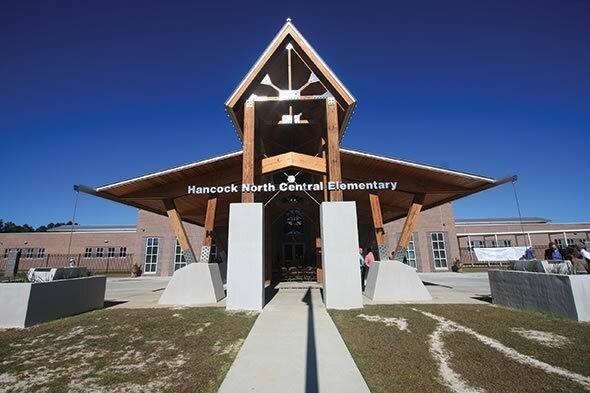 Hancock Elementary is slated to be the first LEED-certified K-12 school in Mississippi. Though it was designed prior to LEED v4, the architects employed product benchmarking practices to compare environmental impacts in several product categories. When USGBC launched LEED v4, it significantly advanced its mission to “transform the way we think about how buildings and communities are designed, constructed, maintained, and operated.” It was, perhaps, the most significant shift in program approaches since LEED was started 14 years ago, with changes designed to push designers and builders into new realms of sustainability innovation. Some of the most dramatic changes came in the Materials & Resources (MR) section, where product transparency and life cycle assessment (LCA) are given considerable emphasis – encouraging, if not forcing, a more holistic view of product specification. In previous versions of LEED, the MR section included credits for single attributes such as recycled content or regional materials (sourcing products from within 500 miles of the jobsite). That initial approach was suitable for the program in its early years, when the idea of green certification and specifying green materials were new concepts. Under LEED v4, architects can earn credits for specifying products that have a third-party-verified environmental product declaration, such as that available from CalStar. But most stakeholders agree that, while that initial approach had value, it also had limitations. Most notably, it essentially allowed people to pick some attributes, while ignoring others. For example, a product that incorporated a large quantity of recycled material could earn credits, even if that product also had a high carbon footprint. With experience, as well as a much wider selection of green products, it is now easier to build a green building than it was a decade ago. USGBC recognized that they could encourage people to look for ways to get even greener, and challenged the program committee to look at the MR credits more holistically. The result is LEED v4, released in 2013, in which the MR section promotes product transparency by awarding credits for using products with LCAs and that reduce environmental impact in multiple ways instead of just one. Under LEED v4 Materials & Resources, users can earn several credits. There are credits available for using products that state what materials are used (product disclosure). There are also credits for products whereby manufacturers reduce the environmental impact (product optimization). Option 1. Use products with some sort of Environmental Product Declaration (EPD). These are products with publicly available, critically reviewed LCAs conforming to ISO 14044. Products with externally verified LCAs are considered more transparent than those with internally verified LCAs. This is a document based on the results of the LCA published by the manufacturer. It shows the environmental impact of the product in a variety of categories (e.g., fossil fuel depletion, global warming potential, etc.). This document can be weaker or stronger depending on the rigor of its third-party review. Or USGBC-approved program that creates some sort of EPD or other sustainable product certification. Use third-party products with documented reduction in environmental impact in at least three categories, compared to industry average. Note that this option requires some sort of industry average information to be available, which is not always the case. Categories include global warming potential (greenhouse gases), depletion of the stratospheric ozone layer, acidification of land and water sources, eutrophication, formation of tropospheric ozone, and depletion of nonrenewable energy resources (fossil fuel use). Or products must comply USGBC approved multi-attribute frameworks. In addition, extra credit is given for products sourced within 100 miles of the project site. This is one way in which the regional materials attribute is retained with LEED v4. The idea here is to reward stakeholders for using products verified to have been sourced responsibly. Manufacturers use raw materials suppliers who source materials responsibly and have clear, ecologically responsible land use practices, as well as a commitment to reduce environmental damage that could result from material extraction. The user specifies a certain amount of products that meet requirements for “extended producer responsibility” or “leadership extraction” criteria. Functionally, all wood specified is FSC-certified. The recycled materials and materials reuse attributes in previous versions of LEED are embedded in this credit. Extra credit is also given for products sourced within 100 miles of the project site. The idea behind this credit is to ensure that manufacturers reduce use and generation of harmful ingredients. Option 1. Report all ingredients that make up at least 0.1% of product. Manufacturers can keep intellectual property or proprietary chemicals secret as long as they disclose what the chemicals do and if they are harmful. And/or Option 2. Use no harmful substances. Substances of concern are listed in a comprehensive database (or on multiple lists). Any ingredients used in quantities greater than 100 ppm are considered. And/or Option 3. Use products from manufacturers whose supply chain has already been third-party verified to manage health, safety and environmental characteristics of chemical ingredients. Alternatively, source products from manufacturers with robust safety, health, hazard and risk programs that document at least 99 percent by weight of all ingredients that go into the product. 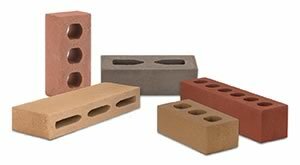 With an environmental product declaration providing third-party verification of life cycle impacts and SMaRT certification indicating environmental savings and supply chain transparency, CalStar Products’ bricks qualify for a variety of Materials & Resources credits under LEED v4. Overall, stakeholders are strongly encouraged (via the opportunity for credits) to seek out and use products whose environmental impacts and supply chain have been externally verified according to industry-approved standards. At this early stage, having the documentation itself is arguably more important than what it says. Several of the credits can be earned regardless of the results. For example, two products with externally verified EPDs contribute to the several of the same points, even if one has a significantly higher carbon footprint. (The product with the lower carbon footprint might also be able to contribute to other points.) At present, the goal is to promote transparency. Once this has become standard practice, it is conceivable credits will start to emphasize environmentally preferable products. In the meantime, the information is available for consideration, enabling specifiers to choose environmentally preferable products, even if the reduced environmental impact is not required to earn certain MR credits. Building Systems Design Inc. (BSD), a company offering software tools for the architecture, architectural engineering and construction markets, has published revisions to 116 specification sections related to sustainable design for architects and engineers. BSD SpecLink-E, BSD’s automated specification production system, has supported the various LEED rating systems published by the U.S. Green Building Council (USGBC) for many years. BSD’s latest sustainability updates support LEED v4 BD+C, USGBC’s most recent green rating system. The updates support other green initiatives, such as the Green Globes project developed by the nonprofit Green Building Initiative. Contract Documents – Requirements explicitly included on drawings and/or in specifications, such as site boundaries for vegetation protection and contractor’s quality procedures. In general, BSD places the sustainable design requirements in each applicable specification section, rather than gathered together in a single section, so the issues can be addressed independently of which rating system is being used on a particular project. BSD SpecLink-E is built on a relational database, rather than word processing files, so BSD has built into the database more than 170,000 “intelligent links” that help to edit project specifications based on decisions made by the user. This linking feature is especially helpful when a design professional wishes to pursue certification under a particular green rating system. By activating Section 01 3329 – Sustainable Design Reporting, a user can select the desired rating system, and make further choices from the options presented. The built-in links will automatically activate related provisions in other spec sections. When all necessary specification sections have been fully edited, the system can print a submittals report that lists all sections in the project requiring submittal of sustainable design documentation. Subscribers to BSD SpecLink-E can automatically download and install the hundreds of paragraphs involved in this sustainability update through a new software feature. Instead of quarterly updates that replace the entire master database, BSD’s system lets users choose to have updates downloaded as frequently as daily, but not less often than quarterly. Or, the user can download and apply all available updates to the master database within a few minutes. The overarching result of LEED v4’s shift in focus is the specification of more transparent products – those that take the holistic approach of life cycle assessment and look beyond single attributes. This allows users to understand where environmental tradeoffs might exist so the best decisions can be made for each specific project. Eventually, the building industry might follow the path of the food industry: The FDA developed a standard nutrition label for foods so consumers can make informed comparisons. Product users would like to see building products more comparable, so it is easier to understand the impact of products. Where food labels contain fat content and calorie count, product labels might spell out fossil fuel consumption and recycled content. Just as some consumers might watch sodium or sugar intake depending on personal needs, some specifiers might be more concerned with carbon footprint or water resources, depending on project needs. The new system also allows innovative products with reduced energy use, carbon footprint, and other environmental impacts to contribute to a variety of credits. In previous versions of LEED, there were no formal credit opportunities for these types of products, other than Innovation in Design credits. As with any major change, there are drawbacks. Possibly the biggest concern is the relative dearth of products with LCAs and published EPDs or HPDs. Further, finding them isn’t as straightforward as it could be. There’s no master list to discover EPDs across the industry. (Each EPD program operator has a list, but there are numerous EPD program operators.) The onus is on specifiers to perform the extra research in pursuit of increased sustainability. However, demand for these tools is increasing. Last year, the concrete industry finalized Product Category Rules (PCRs) for concrete, which laid the groundwork for concrete manufacturers to conduct individual LCAs and publish EPDs. 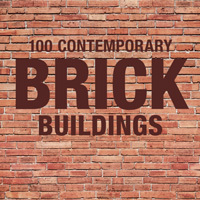 In addition, PCRs have recently been finalized for concrete masonry units. 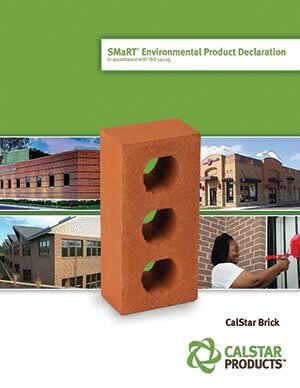 In late-2012, CalStar Products published the first EPD in the brick category, with the document providing third-party verification of environmental impacts. CalStar bricks also received a SMaRT sustainable product platinum rating, indicating significant reduction in environmental impact, as well as supply chain transparency and minimization of harmful chemicals. These documents together allow CalStar bricks to contribute to a variety of MR credits under LEED v4. Similar advances are underway in other product categories, as well, particularly carpet, gypsum, and wood. Perhaps, 14 years from now, we’ll view LCAs and EPDs as commonplace and straightforward as trying to use more recycled materials and sourcing locally. Julie Rapoport, Ph.D., P.E., LEED AP BD+C is VP of engineering for CalStar Products. Reprinted with permission from Nov. 2014 Masonry Magazine. Mesa Community College (MCC) in Mesa, Ariz., serves the academic needs of nearly 26,000 students by offering more than 200 degrees and certificates in everything from biotechnology, computer science, and dental hygiene to mortuary science and urban horticulture. 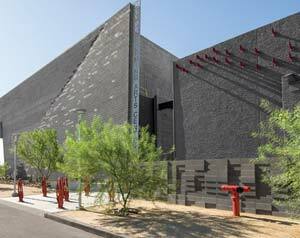 However, it was a re-dedication to music and the arts that gave birth to a new Performing Arts Center, acoustically fine-tuned with an inner and outer shell of sound-reflective masonry.